With all of the publicity that organic foods have received in recent years, you’re probably aware by now that organic foods can be a great way of minimizing your consumption of nasty chemicals, such as pesticides. The real question is – Is the word organic just marketing hype? And how much of it is legitimate? When it comes to fruits and vegetables, a good general rule of thumb to apply is that if the outer layer, skin, or peel is inedible, you can get away with buying the conventionally farmed variety. This means that foods such as bananas, kiwis, onions, avocados, and garlic are absolutely fine to purchase in their non-organic forms, because you’ll be discarding the outer peel or shell. Fruits such as apples and berries should always be purchased organically because the skin is very thin and you’ll be eating the outer peel. Animal products are a more complicated matter, as animals which are raised without hormones and antibiotics are still usually fed a grain-based diet, which is completely unnatural and results in a great deal of weight gain and inflammation in humans. When it comes to meat and dairy products, it is wiser to try and source products that are grass-fed and organic. Especially when it comes to fattier cuts of beef, organic is better because there are no antibiotics. In non-organic meats the antibiotics are stored in the animals fat cells. 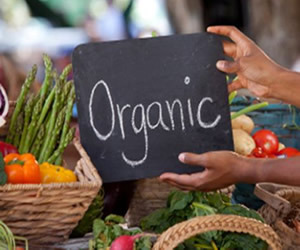 What foods do you buy organic? Is it everything or only a few different items? Let me know us know in the comments section below!